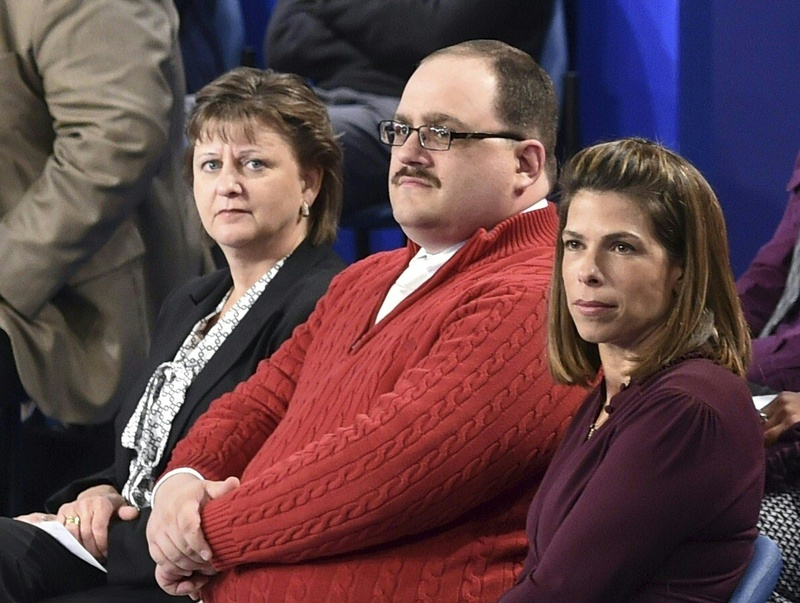 Surely you haven't forgotten the name Ken Bone. He won the debate Sunday, and arguably the Internet too — you need only see the memes to understand. Now it's clear that his popularity won't be waning any time soon. During the debate, the undecided voter stood up and asked a question on energy policy, inquiring what the candidates would do to balance fighting climate change with preserving jobs in the energy industry. Now that he has both Hillary Clinton and Donald Trump's answers to mull over, who is Bone voting for? The answer is that he's still undecided — and "more undecided" than before Sunday night's second presidential debate debate, he told Jimmy Kimmel on Monday. Before the town hall he was leaning towards Trump, but he thought Clinton did a better job speaking to the issues and avoiding negativity. "There were a lot from both sides, but I feel like Mr. Trump did a lot more of the talking over and the personal attacks," Bone told The New York Times on Monday. "I would have liked to see less of that and more on the issues." He told the paper he would make his final decision after the third debate on Oct. 19. I don't want to see anyone's rights stripped away. We fought very hard to get equal rights for groups that have never had them before. I'm so glad that they have them now. I don't want them to lose those rights. So this election cycle, personally to me, is about my interest vs. the common good. It's a tough one. I really haven't made a final decision yet. I'm happy to do as much media as people need to me to talk about the process and talk about getting people out to vote. I will state that I will not endorse either candidate and you will not hear me saying who I will be voting for before the election is over. If you hear that, it's not me. No doubts there. What's clear is that there are plenty of reasons to love him. His Twitter is full of positive messages about voting and having dinner with his grandma. He also explained why he wore that red sweater to many news outlets. It was totally Plan B. He'd picked out an olive suit, but... "Apparently I've gained about 30 pounds," he told CNN, "and when I went to get in my car the morning of the debate, I split the seat of my pants all the way open." Who would have guessed a wardrobe malfunction would turn into such a win for democracy. So follow Bone's lead. Go get yourself a sweater, watch the third presidential debate, and please do not forget to vote.